This example demonstrates how to calculate the gravity gradient tensor (GGT) due to topographic masses using tesseroids. 4 # the DEM file using the Python script. Python is a modern programming language that is very easy to learn and extremely productive. We’ll be using it to make our lives a bit easier during this example but it is by no means a necessity. The same thing could have been accomplished with Unix tools and the Generic Mapping Tools (GMT) or other plotting program. If you have interest in learning Python we recommend the excelent video lectures in the Software Carpentry course. There you will also find lectures on various scientific programming topics. I strongly recommend taking this course to anyone who works with scientific computing. Notice that Tesseroids allows you to include comments in the files by starting a line with #. This figure shows the DEM ploted in pseudocolor. The red rectangle is the area in which we’ll be calculating the GGT. The ETOPO1 10’ DEM of the Parana Basin, southern Brasil. Program tessmodgen allows us to provide the density value of each tesseroid through the DEM file. All we have to do is insert an extra column in the DEM file with the density values of the tesseroids that will be put on each point. This way we can have the continents with 2.67 g/cm3 and oceans with 1.67 g/cm3. Notice that the density assigned to the oceans is positive! This is because the DEM in the oceans will have heights bellow our reference (h = 0km) and tessmodgen will automatically invert the sign of the density values if a point is bellow the reference. 2 Assign density values for the DEM points. 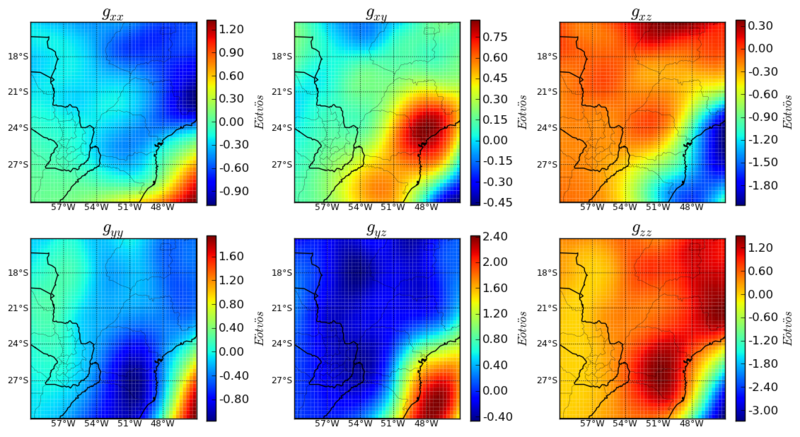 Density values. 2.67 g/cm3 in continents and 1.67 g/cm3 in the oceans. tessmodgen places a tesseroid on each point of the DEM. The bottom of the tesseroid is placed on a reference level and the top on the DEM. If the height of the point is bellow the reference, the top and bottom will be inverted so that the tesseroid isn’t upside-down. In this case, the density value of the point will also have its sign changed so that you get the right density values if modeling things like the Moho. For topographic masses, the reference surface is h = 0km (argument -z). The argument -s is used to specify the grid spacing (10’) which will be used to set the horizontal dimensions of the tesseroid. Since we didn’t pass the -d argument with the density of the tesseroids, tessmodgen will expect a fourth column in the input with the density values. Tesseroids allows use of custom computation grids by reading the computation points from standard input. This way, if you have a file with lon, lat, and height coordinates and wish to calculate any gravitational field in those points, all you have to do is redirect stardard input to that file (using <). All tess* programs will calculate their respective field, append a column with the result to the input and print it to stdout. So you can pass grid files with more than three columns, as long as the first three correspond to lon, lat and height. This means that you can pipe the results from one tessg to the other and have an output file with many columns, each corresponding to a gravitational field. The main advantage of this approach is that, in most shell environments, the computation of pipes is done in parallel. So, if your system has more than one core, you can get parallel computation of GGT components with no extra effort. The end result of this is file dem-ggt.txt, which will have 9 columns in total. The first three are the lon, lat and height coordinates generated by tessgrd. The next six will correspond to each component of the GGT calculated by tessgxx, tessgxy, etc., respectively. The resulting GGT is shown in this figure. GGT of caused by the topographic masses. 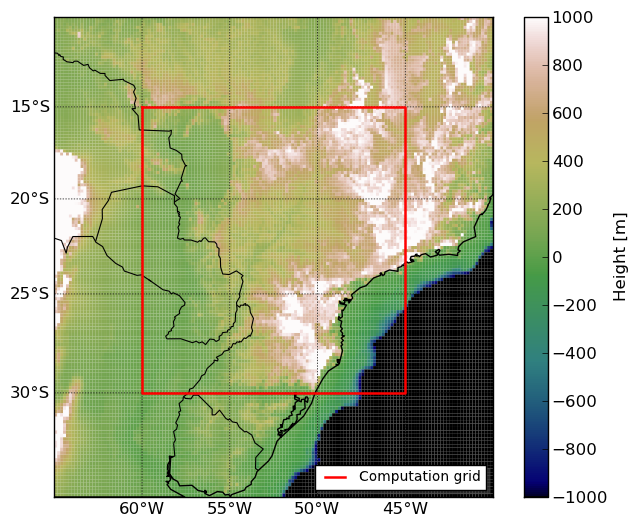 The plots were generated using the powerfull Python library Matplotlib. The script plots.py is somewhat more complicated than dem_density.py and requires a bit of “Python Fu”. The examples in the Matplotlib website should give some insight into how it works. 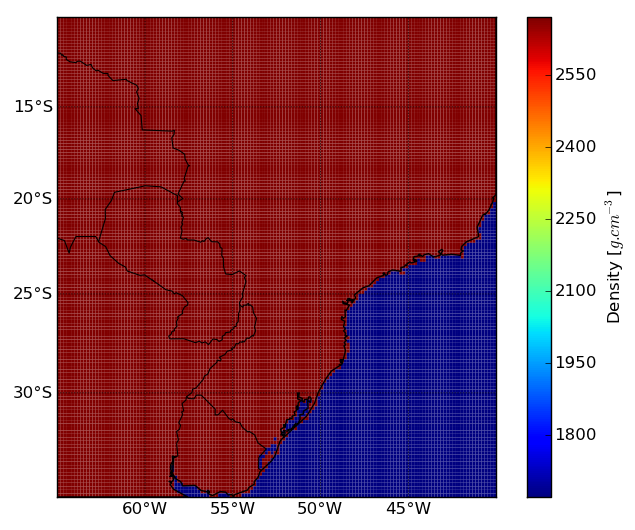 To hanble the map projections, we used the Basemap toolkit of Matplotlib. © Copyright 2009-2017, Leonardo Uieda. Revision 05086f66.